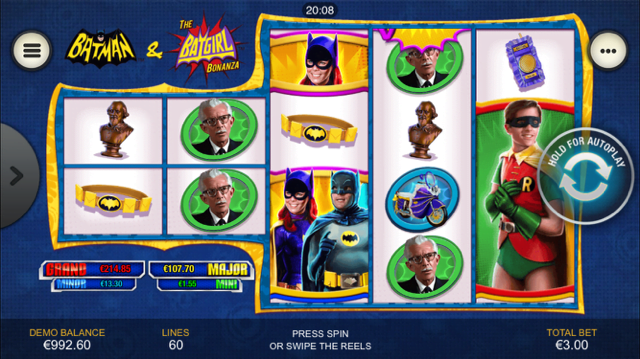 Batman & The Batgirl Bonanza slot machine from Playtech is part of the now legendary DC Comics series, and features the sexiest of villains in the series, Batgirl. The game is a 5-reel, 60 payline jackpot slot that has a max jackpot of 2,000 coins per line bet. It has two superb bonus rounds, one of which is a free spins bonus round that has between 12 and 25 free spins. Read all about the game in Batman & The Batgirl Bonanza slot review below. Unless you’ve been living under a rock for the past few months, you’ll no doubt be aware that the latest jackpot slot sensation sweeping the mobile casino world is Playtech’s Batman franchise. A hugely stylised selection of games that all connect to the DC Super Heroes Jackpot, there are currently six titles available and the Batman & The Batgirl Bonanza slot is one of the more recent additions. Featuring an unusual 2-2-4-4-4 reel formation, the slot boasts a total of 60 fixed paylines and a gameboard that is decorated with recognisable characters that appeared in the kitsch ‘60s TV show. Playable from as little as £0.30 per spin across all desktop, mobile and tablet devices, the game boasts a regular base game jackpot of 2,000x players’ bet per line – and although that pales in comparison to the progressive prizes on offer, it’s still a nice way to keep your bankroll ticking over. Additionally, the slot also boasts two free spins features that are capable of awarding huge payouts. Given the obvious crime-fighting bond between Batman, Robin and Batgirl, it should come as no surprise that co-operation plays a key role in the Batman & The Batgirl Bonanza slot machine. Indeed, special co-op symbols appear throughout the game and can substitute for either hero depicted in them, with this making it far easier to trigger the slot’s Batgirl Locked Respins feature during the regular base game. Activated whenever four matching symbols fill the 2×2 grid created by the first two reels, players will receive five free respins while their triggering symbols remain locked in place. Naturally, when this bonus is activated with the help of co-op symbols, you’ll have even more ways to win big as any of the stacked character symbols that appear on the bigger reel set will potentially create combo wins. On top of this, players will also be able to land between 12 and 25 free spins whenever the “bonus” icon appears on reels three, four and five simultaneously. Known as the Batman Team-Up Free Games, all spins taken during this feature will benefit from the fact that the first two reels will now be filled by one 2×2 super symbol, with this in turn creating far more payline potential throughout. Although not our favourite slot in this Playtech slots series, the Batman & The Batgirl Bonanza slot remains an interesting addition to the line-up that can again award life-changing payouts thanks to its progressive prizes. Like the Batman & The Batgirl Bonanza slot review? Check out these as well…..